Nothing satisfies a former journalist like me more than checking back over my notes and discovering that I did, indeed, write down that nugget of information that forms the crux of my argument. That nugget happens to be about a bottle of syrah and the price tag that was attached to it. Or, rather, the price tag that, to me, seemed just a little bit high. Continuing with my theme of documenting my trip to the wineries of British Columbia’s Okanagan Valley, today I am discussing Church & State Wines. I have wanted to try this producer’s wines for quite some time but for years I was put off because of a run of mediocre reviews. This is a winery that was founded in 2003 just minutes from where I grew up in Victoria, B.C. Originally known as Victoria Estates, it was given the usual assessment that people from Vancouver Island attach to such venture: ambitious, but in the wrong location. It was sold in 2005, the name was changed and the operation became much more serious. For starters, they started making wine in the Okanagan. That was a good decision. However, by that time I have moved to the UK and had access to their wines only when I returned to Canada for a visit. When I planned my visit to the Okanagan, I did a little research and discovered that, according to the now-defunct Wine Access magazine, Church & State makes the ‘best red wine’ in Canada. That wine, the Coyote Bowl Syrah 2009, was what I was after. 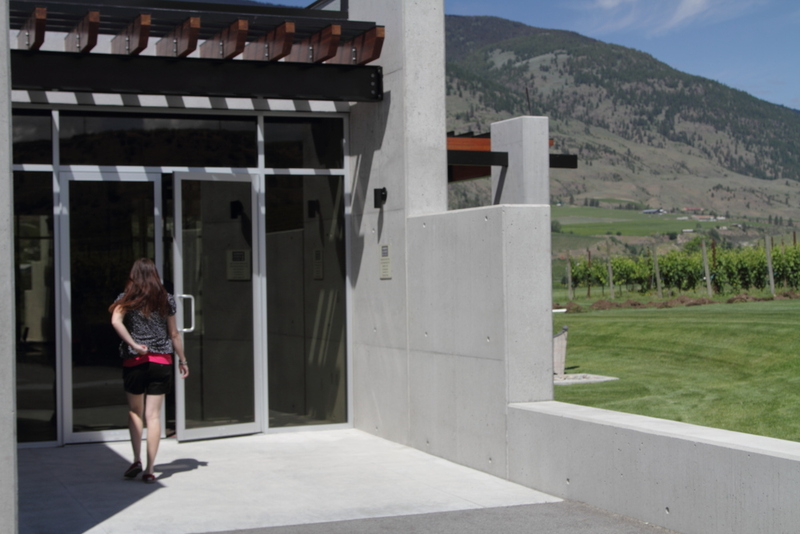 The Church & State tasting room sits off the beaten path among the winery’s vineyards in Oliver, a small town between Osoyoos and Penticton. There isn’t much there other than a small modern winery and tasting room with few frills. The main entrance isn’t even signposted. I give them credit for keeping things simple and without too much pomp and circumstance. When I visited, I had the benefit of being the only person there. Excellent, I thought, because this meant I could have a proper chat with the staff. But when I said I wanted to do a tasting my heart sank. Before my lay a laminated sheet upon which circular place markers had been printed for each of the wines they were going to let me try (for a purported $10, although this might not be correct). Missing from this tasting was the Coyote Bowl syrah I wanted to try. So I made a point of saying that I really only came for the syrah and could I please try it? To which the reply was: No. My notes tell me that this was because the wine was in high demand and they could not possibly open a bottle for tasting when quantities are so small. This isn’t entirely abnormal, but I recall the wines that they were offering to open for me were their more mundane offerings. This was not enough to entice me to stay. And so I walked out without tasting anything and, crucially, without buying anything. I appreciate that it can be difficult to open bottles for tastings when commercial pressures require them to be sold. However, I was even more aghast when I discovered how much the price had risen after the award was given. When Wine Access magazine said the Church & State Coyote Bowl Syrah 2009 was the best wine in B.C., they reported that the retail price was $26. That’s a reasonable price for such a highly acclaimed wine. When I asked the woman at the tasting room for a price on the 2009, I was told it was $50 per bottle (although the website currently says it was $35). If I wanted the 2010, it was $35. That’s a hefty jump on the original price of $26. I guess this is the effect of being an award-winning wine and being high in demand. Although I note that other wineries with great wines, such as Sandhill, tend not to raise their prices as demand increases. Even better, if I wanted the 2009 and the 2010 together in a special edition wooden box, the price would have been $90 for the pair. To this day I still have not knowingly tasted a wine from Church & State.